As I mentioned in a previous post, I brought back two gorgeous sausages from The Butcher Shop in Boston, one spicy, the other sweet. My intention was to use them as a sort of centerpiece for a little afternoon cocktail party I wanted to throw. Well, not really a party. Just an intimate gathering featuring nibbles and drinks. I planned on building a little charcuterie board which I would round out with some interesting cheeses, crackers, olives, nuts and grapes. Being known amongst my friends as someone who cooks reasonably well, it felt like a bit of a cop out if I invited people over and all of the food was bought, not home made. I mean I'd feel let down if I was invited to dinner by someone known for their kitchen prowess and we were served take away. And so, brainstorming began. What could I make to go along with my menu of small bites? Last weekend inspiration struck at a birthday party Mark and I had been invited to at a beautiful home in Hancock Park. It's not often that I'm really impressed by the food people serve at parties. Does that sound snobby? I'm sorry but it's true. Usually it's bags of store bought, name brand chips, store bought dips. Trays of turkey roll ups that you can get from the deli department at the grocery store. Not that there is anything wrong with any of these things. It's just that it's quite obvious that some people just don't care about the food they serve. They just feel obligated to serve SOMEthing. Fine. I totally get it. I admit that one of my biggest weaknesses at a party is a giant bowl of Doritos. I will graze on a bowl of Doritos. So anyway at this party there was, first of all, an amazing cheese tray, each wedge speared tiny little signs naming the cheese. LOVE that. Points for the cheese signs. There were several interesting salsas and some guacamole that appeared to be home made. Points for the homemade guac. Points off because it desperately needed salt. 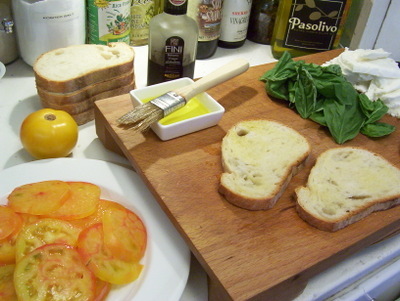 And then there was a platter stacked with thick slices of good bread, each topped with fresh mozzarella, big basil leaves and slices of sunny yellow tomatoes, all of which was drizzled with olive oil and balsamic vinegar. The host urged us to try them, going into detail about how he got the mozzarella at Bristol Farms, marveling that it came in a little tub filled with water. Needless to say, I was very impressed. So simple. So classic. Bonus points, for the buffalo mozzarella and for using yellow tomatoes rather that the more obvious red. 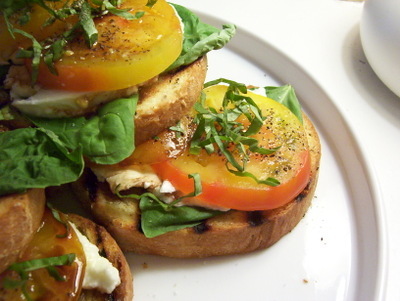 So for my little gathering I decided to do a variation of this insalata caprese on bread. My twist - grilling the bread and rubbing it with a cut clove of garlic. Clever, no? Extra bonus points for grilling and garlic. Unfortunately, the sausages turned out to be incredibly hard to cut and chew. Points off. Thank God I made these toasts. First make the garlic toasts. Heat a cast iron grill pan over high heat for 5 minutes, until it's super freaking hot. Mean while brush both sides of the bread slices with the olive oil. Place the bread slices in the grill pan and press down slightly. Grill the bread for about two minutes per side, until the edges get crusty and there are light grill marks. Remove the bread from the pan and rub one side of each slice with the garlic. Continue doing this until all the bread is grilled. To assemble, place the grilled bread on a serving dish or platter. Top each slice with several whole basil leaves (putting the basil down first prevents the bread from getting soggy), then slices of mozzarella, and finally slices of tomato. The number of slices you use depends on how big the toasts are. Using the same brush you used to brush oil on the bread, brush the tops of the tomatoes with some more oil and then season with kosher salt and freshly ground black pepper. You could drizzle it with the oil, rather than brushing, but I find I have more control using a brush. Next spoon a little of the balsamic vinegar over the tomato and then finally scatter with the sliced basil. Serve warm or at room temperature. How pretty is that? Seriously. It's dishes like this that's changing my feelings on raw tomatoes. I've long believed that if there is a food that you don't think you like, it's because you've had an inferior example of it. Maybe that's been my problem with tomatoes. Tomatoes really need to be enjoyed at the height of their season and heirloom is the only way to go. The flavors are so much more complex. Combined with the creamy mild buffalo mozzarella and the bright freshness of the basil, this dish is the embodiment of summer. 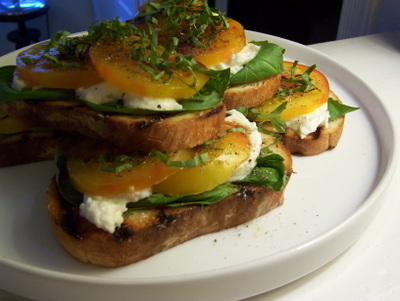 And I think that by placing the insalate caprese on the crunchy, garlic tinged toast adds a very welcome layer of texture and flavor. They are amazing served warm, but they are equally tasty if they are made in a little in advance and served at room temperature. In fact, it's kind of nice to make them a little ahead of time because the bread can absorb some of the moisture of the cheese, the tomato water, and the balsamic vinegar so it gets just slightly soft, but still has some crunch. It was probably my favorite thing I served at my little happy hour soirée although I think it would also be a great starter at a barbeque or something where people are eating out of doors. Posts like this confirm the fact you are super freaking talented. YUM. ok - confession. I don't usually like raw tomatoes. I think its a texture thing but these were amazing. I could have eaten the entire platter. thank you again for the lovely evening. - I wish I saw this before! never try it with "yellow" tomatoes though. I'm super disappointed to hear the sausages were hard and chewy. I live in Boston and so far have only ever gazed adoringly at the display cases while scarfing my Butcher Shop fix. I've been perfecting a sausage/cheese bread lately and was going to use some of their sausage for the Grand Unveiling. I'd better do a private trial run before the Unveiling, eh?! I wonder if cooking the sausage IN something (like a risotto or stew) would improve the chewiness as the sausage would absorb some moisture? Insalatta caprese is fabulous already, and you've made it even better! This looks like such a wonderful light supper dish for these hot summer evenings! a perfect whole tomato bruschetta. which, if i may say - no matter how many times it's done - is just perfection. i LOVE bruschetta with a passion. the above version to me would be absolute heaven. i WANT THIS NOW!!! Last weekend inspiration struck at a birthday party Mark and I had been invited to at a beautiful home in Hancock Park. Top each slice with several whole basil leaves (putting the basil down first prevents the bread from getting soggy), then slices of mozzarella, and finally slices of tomato. The number of slices you use depends on how big the toasts are. The operator of the stricken Fukushima nuclear plant detects radiation in the ocean nearby as efforts continue to cool overheating reactors. A U.S. Air Force fighter jet crashed in Libya after experiencing an equipment malfunction, but both crew members ejected safely and are now out of Libya and in U.S. hands, the U.S. military and a senior U.S. defense official said Tuesday.